Scouting Notes: Keelan Doss seems to do everything well. We just haven’t really had much chance to see him do it against premier competition. 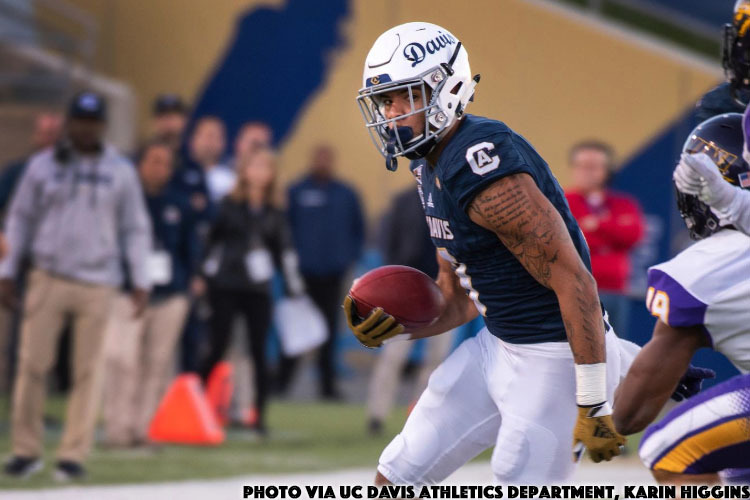 As a former Big Sky Offensive Player of the Year, he’s made mince meat of his FCS foes, but aside from games against San Jose State(11 catches for 85 yards) and Stanford(13 catches for 103 yards), he doesn’t have much to show against major programs. Doss has a prototypical developmental X receiver build – long and powerful and a catch radius that seems immeasurable. It’s rare that a ball thrown his way gets past him, as he’ll go up and get it if it’s not in his near vicinity. This was also true at the Senior Bowl where he would extend for footballs that didn’t always seem catchable during practices. Doss has the strength to bust up the press on the outside, but he’s also a good enough route runner to be effective underneath. One hiccup in his game that we noticed in Mobile was wasted motion coming out of his breaks at the top of his route. This will be an aspect to focus on during on-field drills in Indy and at the Pro Day to see if there is improvement in this area. He displays great body control and awareness, making catches in tight spaces and putting his feet down where they need to be to get the possession. Doss lacks elite speed, but his solid footwork and sharp breaks get him open more often than not. And what Doss may lack in breakaway speed, he makes up for with a penchant for scoring in the red-zone, contested catches be damned. Fantasy Outlook: Doss’ small-school pedigree is probably going to hurt him in the draft. The fact that we haven’t really seen what he’s capable of against faster, stronger DBs like the ones from top-notch FBS programs is going to give teams pause. But remember, he was a Senior Bowl standout. And, his desirable build and obvious intangibles could give him a draft-board boost. If Doss can perform against NFL defenses like he did in college, he can become someone’s go-to receiver, but if the NFL is a bit too fast for him, he could find himself buried on some team’s depth chart, as a situational red-zone threat. Either way, he’s worth grabbing in dynasty formats, just to see how things shake out. He’s got the upside of a Keenan Allen, but it’s probably more realistic to put him in the area of Equanimeous St. Brown right now. 2018: WALTER PAYTON AWARD WATCH LIST (nominated for the second straight season)… COLLEGE FOOTBALL PERFORMANCE AWARDS FCS NATIONAL PERFORMER OF THE YEAR WATCH LIST… PHIL STEELE 2018 PRESEASON ALL-AMERICAN… PHIL STEELE FIRST TEAM PRESEASON ALL-BIG SKY TEAM… HERO SPORTS PRESEASON ALL-AMERICAN… STATS FCS PRESEASON ALL-AMERICAN… STREET & SMITH’S PRESEASON ALL-AMERICAN… BIG SKY PRESEASON OFFENSIVE PLAYER OF THE YEAR… PRESEASON ALL-BIG SKY TEAM… One of the Aggies’ three team captains. ALAMEDA HS ‘14: Three-year varsity letterwinnner who caught 56 passes for 998 yards and 12 touchdowns during his career… Recorded 29 receptions for 577 yards and nine touchdowns as a senior… Enjoyed a monster game against Hillsdale HS, grabbing eight passes for 217 yards and a trio of scores… Picked up at least one touchdown in all eight games he played… Averaged 19.9 yards per reception in 2013… Finished with 26 receptions for 414 yards during his sophomore campaign, collecting season-highs of seven catches and 108 yards against Encinal HS… Team captain as a senior and earned All-West Alameda County Conference 12 first-team honors, his second all-league honor… Named MVP at Arizona State Contra Costa Football Camp… Also played basketball at Alameda HS… Four-year academic honor roll member… CIF-North Coast Section Scholar-Athlete.